Here we are Week 25 - June 15 to June 21 2015, mind blowing that it's nearing the end of June & the ending of school for the kids! I am a broken record when I say that this year is moving fast here, but the school year went even faster. Full view here of wk 25 - as mentioned before I switched this year from the 12x12 album to the 9x12 & it has felt great to switch - it totally works for me and highly doubt that I will go back to 12 x12. What happened this week - First thing that pops up in my mind is garden loving, but then date night, organizing, planning, dealing with migraines, watching Ava paint are all here. Written in but not seen is ... walking the dog, talks with Ethan about everything under the sun + I am totally in love with his outlook on life at only ten years old, trips to the store, drop offs and pick ups. LIFE stuff. These weeks have so much packed into them it seems, but it's not necessary to have it all jammed into my PL don't feel like you need to put it all in - but sum it up. I am - picking and choosing the ones I want to tell each week and that is good enough and to be honest it would feel very boring if I did always add in the "same old same old" each week & after five years of documenting that could be seen. Really it's all bout our lives & the "here and now" so I run with that I know from experience now that our next month may not look like the before so I know how much change happens in these books - It's AWESOME! I love using parts of what is going on around us, I used "Bring on Summer" from Ali Edwards digital set and made it into a 3x4 but then when Ava was painting I tried out a little on my own and loved how it added to the Summer meaning super bright colours and then added the "go see do" wood veneers with martha stewart glue pen. My love for Elise's stamps is no secret by now & they have become a go to for me, but this time I used her digital set she is still selling as a set found here. In photoshop I added the "hers" & "his" in white on our dinner plates. LOVED using white and digital set was super easy to try out different phrases without committing until I was happy with how it looked. That xo card above is a beautiful mess kit - I subscribe monthly to their kits and have been very happy with the kits so far. "hello there" wood veneer added on top. That wraps up week 25! Looking forward to ending this part one album of the year that means only one more week in this vol. and we move onto vol. 2 - I love splitting up the albums and have done that after my 1st album it was far too packed and hardly closed and yes once I get more time in the world I have plans to go back and split that one too. It's also a nice break to the year I find when I look back. Supplies used : Studio Calico kit, tiny attacher, Martha Stewart glue pen,Becky Higgins date stamp, Sharpie marker pen, Avery labels Ali Edwards Digital brushes, Elise Cripe Digital set, Sunshine edition, wood veneers, sewing machine to sew up the page pockets. This year I was super inspired to get over a few creative humps that I never took the plunge on either because A. I didn't know how or B. I didn't want to fail after putting in money and time into another unfinished project & possible frustration that came from that C. Fear. SO this year I am tackling a few projects & so far things are going good it's a learning curve but I am so happy that I took on these creative projects - I have a follower around the house that takes my knitting needles and wraps the yarn around it "knitting like mom" she yells! I stopped and thought how cool is that because I took the leap to learn this & my daughter is now wanting to learn and I can Teach her one day! Of course I have to mention that the Internet is super helpful now vs. ten years ago when I thought about taking on these crafts like knitting, sewing, weaving and these are all very popular right now and you can find tutorials pretty much every where! I liked this video tutorial here for knitting cowls. I liked this video here on how to get your sewing machine set up to start sewing. I like this new ecourse that came out here pretty sure that's on my "courses to take" list and it's on sale right now! This cowl is the third one I tried & I started to play a lot with yarn size thick vs thin and I currently knit on needle sizes 4.5mm 8.0mm and 9.0mm this image above is on Takumi bambo needles 9.0mm 16in. I first started knitting on this size needle in February of this year & totally flopped the first project - It's ok I kept in mind that this might take a few go's at it, Not putting pressure on myself ... I "played" with the first one I made and it some how twisted in the round. Instead of scrapping it I thought I will keep it & use it as a headband ear warmer. That's how it turned out on the front part the twisting just got worse the more I knitted - I have no idea how I did that, but for my very first knit project I kinda like it. This is what it looks like on the back side. The right way. Again I found this pattern from this tutorial here. Incomes project # two. This time I used a larger needle 8.0mm at 36in length - THIS IS HUGE this cowl in the photo above is folded in half, it's twice this length and surprisingly it was very easy to work with and I liked the thickness of the chunky wool. I started out with the grey fleck colour then that ran out and so I switched to all black to finish it giving it a colour block. I really enjoyed this yarn and colour scheme. Photo above is my IG photo here about adding in a new colour. No twisting on this one (thankful for that) and kept at it. As I start really getting into these projects I noticed quickly how addicting yarn is ... my collection is growing, I some how can't leave the craft store without YARN. I figure at least I am putting it to use so no harm in purchasing more. So that's where I am at right now on the whole taking on new projects, It is totally a creative pursuit that I am on & loving it. Learning so much as I go. Again internet is so helpful! Maybe one day I will branch out of cowls and make something else ... one day. Thanks for reading & have a great weekend! Hey, Week four of my Project Life and above a full two page view of the week. I LOVE this project! Obviously. Close up of right side & that "Thankful for this day" circle is from Ali Edwards digital brush set found here. This week I took Ava the the local Art store & we both spent hours there lost in paint colours and brushes. She is taking after her Mama so much! This Week the temps were NUTS for local Winnipeg weather, Minus three in January NEVER happens and we hit a record. This week Ava was sick with the stomach flu & that sucked we were up all night with her and even though we were all tired more like exhausted we had to power through and I tried so hard to just keep anything in her stomach between episodes. By 5pm the next day she was out of the woods and able to keep down solids again ... that was only Monday. I used Studio Calico Far far away kit again, and love that card with the city line "it was one of those days" cards I stamped "we are made of stories" stamp from other kit & added a "simply perfect" wood veneer with Tiny attacher. Another Studio Calico card "everything will be alright"
Shot of my chicken noodle soup from Monday that Ava & I ate. Journaled "soup for the win". "&" card another Studio Calico card. This week was better than last, it always goes that way ... that's life. That wraps up this week and "let the good times roll" right! This week I used four 3x4 photo's and three 4x6 photo's (one cut in the middle to fit two 3x4 pockets). Six photo's from my iphone 4S and two photo's from my Canon 5D total of eight photo's. Thanks for following along with my Project Life updates here. Around Here - I am hanging in my office space A LOT more these past few weeks and LOVE it, all day is a dream but still break it up with school drop offs and pick ups ... cleaning & eating (forget to do that some times once I get going in here). I am loving the creative thoughts that happen in here although not always flowing I still get blocked & that's when I walk away, Listen to music, watch netflix, put it down for a day or two and come back. Around Here - Drop boxing, Pinterest browsing, Listening to Songza always current fave is "cool new music : Winter 2015" it sit's in the background of my time in here and in a way inspires my thoughts and I totally get lost then come back again (coffee breaks & day dreaming). Around Here - Current doorway view walking into my space and needing to get at filling that bookshelf but items are finding their way on there slowly. Rug from Winners. I think that it won't stay there & instead a larger rug will replace it. Working on a placement in this space, I like all my furniture and everything is functional here but I am the type of person that needs to move the furniture AROUND every now and then ... it's now. Around Here - On my desk, Brushes recently purchased at local ART store and on sale for $1.80 + $1.29 HA total score and almost bought them all! iphone, Pens, markers, scissors, journal, studio calico cards, speedball fabric paint, my ring. Around Here - Fave corner of this space and needing to add more art to that wall. Around Here - on my work table, Ali Edwards digital brushes I make into 3x4 for PL weeks and I LOVE this one so so much you can find it here. Also on my work table Coffee *always. Around Here - found a "home" for my old stendig calendar set, I won't throw these out but not sure yet what else I will do with them (other than in my PL) - right now I like them as they are. Around Here - loving my plants although I am not the best keeper of them they still put up with me and are doing ok & this month I threw out one and bought four. It's only January and I am dying to plan out the garden ... ugh. Thanks so much for reading my AROUND HERE! cheers. I feel like the other part of that title should say "where things are ... where things are going" as we get closer to the end of the year here & ring in a New one again. So I am wrapping up a whole wack load of projects ... photographing them and edits for various uploads and shares. First off wrapping up an amazing Creative Team Year with Becky Higgins and man I can say that this year on her team just blasted past me, I loved the team that I was able to share this year with & hope to keep in touch with them as we all break off into other directions from here. I loved the generosity of Becky and Kari when I asked them to do me a favor and help out a friend dealing with her daughter in chemotherapy, Oh did they deliver! THANK YOU Becky & Kari for that so much! I loved that I was able to share each month & Inspire many ... it is always awesome to hear that I ACTUALLY did inspire a few of you out there many many THANK YOU(s) too all my readers here and on Instagram I am humbled! I never imagined that when starting PL that it woud be such a HUGE part of my life & take me where it has ... I am so ready to go where ever it may take me! I hope that YOU all still follow my journey of sharing and HA teaching my first ever class this past year was a BIG learning experience for me and so very very honoured to be a part of that! Thank you Becky for trusting in me to inspire & share and inviting me into your Project Life family ... for life! I Still remember getting that first email from you and that feeling of " NO WAY ... Becky Higgins just emailed me" It was a true BEST moment for me!! Thank you for an amazing year my friends ... keep being awesome! Now that a New Year is around the corner I always seem to have the need to finish up and look at the approach for the new year albums a whole lot is always the same I document weekly (always) so that will stick & the rest is just deciding on album colours and title page and kits and a whole lot of organizing my space and if you took that BPC class then you have an idea of what that means ... if you didn't then it means pulling kits out and organizing them into sets that I like. As I get into documenting my sixth year with Project Life system I have seen so much change in this community and with PL so so happy for all of it and so the success of PL - I still need to streamline the amount of product I use ... I just work better that way! In the next few days I will wrap up my 2014 album and share here & also my December daily album too skipping over Christmas time but return before the New Year and at that time I will reveal my 2015 opening page and plans on that Album. Once again I want to say Thank you too all my readers and followers on IG ! Wish you all a Merry Christmas & all the Best in 2015!! Project Life | Week 46. So it's been awhile since I shared a recent PL spread and this feels very good to get done and get ahead again ... I am teaching a class called catch up with Project Life Over at Big Picture Classes, but I also practise what I am preaching over there and I am getting caught up with my weeks too. True Story card is from a Studio Calico kit. "for the love of" stamp is a Elise Blaha Cripe stamp. Date stamp & wood veneers (of course). Make more card is another Studio Calico card. Date stamp and wood veneers on both the photo & card. Black stripe card is from Midnight Edition with a "noted" veneer attached with tiny attacher. I am still using and loving these white tabs to add little journal on the photos. Another week wrapped up and this year is nearly done ... which is so crazy! I know it's feeling that way for a lot of us. Work and school is so busy then through in kids activities and projects, and of course christmas around the corner! Office Tour 2014 | Where I create. Hey Today I am sharing where I create + hang out with my family. My office space right now is in our home that we purchased in November of 2012 & when we viewed our home I wasn't able to see this room due to it being closed off in our freezing cold winters. A Sunroom addition! this room was a serious bonus for us and as the months went by it became warmer and as I opened it for the first time I was hit with this excitement and said "WOW it's my new space" I immediatly knew that it would serve as a seasonal creative space for me and give me that break from the basement office that I temporaily created. LIGHT is something I crave by the time March rolls in & Light we get! We have two large patio doors on each side of the room and one LARGE picture window you can see above the desk there. So yes it get's a ton of sun, I eventually want to replace the patio doors and put in french doors to update the space. One side of the sunroom patio doors leads out to our backyard deck the other side leads to the courtyard patio space that meets the backdoor and garage. The layout of this house is something I have never seen before and everything I love about it!! At my desk I am a Pinterest-holic ! various artwork hang above my desk and computer. I print all my photo's at home So there is a lot of scraps of trimmed paper around here, I trim at the bookshelf beside my desk ( both Ikea purchases). My printer is kept under the desk on a roller cart with very easy access and easy to get to with out having the bulk of a printer on my shelf or desk. keeping treasures close at hand. Keeping my latest new purchase close too & loving this to customize any page pocket or layout I need (just started sewing in April). Trimmer talk, I use two trimmers and there is no rhymn or reason when I use either one. X-acto & Fiskars. 2012 & 2013 albums ... and a whole lot of things get stored in these shelves. Since 2012 i have been a two album user and that's ok for now. You can see the hole puncher I use top left there my trusty Crop-A-dile II is very handy! Where I put it all together - My working table is the best Kijiji purchase I have made to date. Fourty dollars and I love that I can lay out my entire PL spread and my card container I use also from Ikea (above is my stendig calendar). I use three of these clear Ikea containers to hold all my supplies like PL cards and stamps, wood veneers, buttons, punches, tiny attacher stapler .... much much more. Also using my tables drawers for inks and various project items, week in the life, december daily, day in the life. Love this space and the time that we spend in here about six months of the year, On the opposite side of the bookshelf is a couch and on cooler summer nights I open the doors and hang out with the kids watching something on netflix "movie night in the sunroom" with popcorn & it's a fave place for most of us even the dog. I also love that the previous owners put up the cedar walls and the pattern that they used ... I feel like I'm in a cabin tucked away somewhere. Thanks for letting me share my Office space with you & thanks for reading! * I am working on a post of current supplies I use watch for that coming soon! Project Life | Week 28. Hello Project life week 28 & that is crazy how fast we are here! SUMMER is nothing short of awesome and we are pretty much loving anything that's not -40 in these parts and I don't want summer to end. EVER. Here is the left hand view of my full 12x12 and the back of the insert used in this weeks spreads ... TRAVEL & ADVENTURE have been the popular words in our family. This spread highlights another lake trip & each trip has it's own BEST moments ... even though it's another getaway they all have their own stories to tell. This week I also made a new monthly page with Liz Tamanaha's calendar cards and you can see that here as I am a Creative Team member on her Design team as well & was recently featured on her blog! LOVE her work go check it out!! That wrap's up another week here, Hope you are all having an amazing summer! Thanks for reading!! For more information on Project life visit Becky Higgins | here. I love the sky & bright blues and white puffy clouds so dreamy! Evenings at the park & the kids swinging on the swings. Of course loving the garden and the patio plants. Yes! We are loving summer and right now! Hello Project life week 26 & the end of album number one. This week I added in some brushscripted cards that I made a few months ago. I also made the custom pockets from Design D.
I closed up the 6x4 slots and made more 4x3 pockets ... I am hooked on sewing on pockets! This week I also used Sunshine edition and some wood veneers from studio calico. Left hand side of this full page view is Design F with a closed up pocket to fit 12 3x4 spaces. I trimmed down the sunshine edition title card to also fit 3x4. Full view of Right hand side. That veneer "june" is from my Studio Calico kit called "hello hello". Adding in some journaling on the half & half cards and sewn them up the middle. Yes to making our way through another long winter and to celebrate summer & getting to the documenting part our life. This is still a favorite way to keep record + document still after four years I am loving this project! I am not yet sure how I will approach next years style in terms of kits and albums ... my 6x8 cookbook I was working on has taken a backseat and I would love to focus on that for a while too. 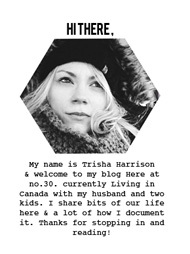 I am very grateful for Becky Higgins in creating this style of how we can document our lives & I am loving the oppourtunity to be sharing along on the Creative team. For more information on Project life check out Becky's site. Thanks for reading ! !